95%polyester+5% spandex ;soft, breathable and comfy to wear The dress is a super realxed fit with a stunning scoop hemline and high neck! 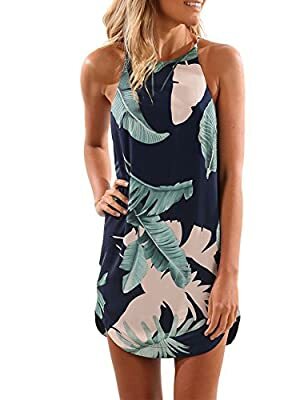 Fresh flower print dress,hawaiian mini beach dress, mini casual sundress,mini tank dress.Great suit for vacation,holiday,beach summer. Please note each individual product the print or pattern may vary. Note: our actual size differ from Amazon size standard, please refer to the photo of the product image for our detailed size chart.